In direct contrast to the snow we got last week the weather this week has been perfect. Sunshine and warmer weather is finally here to stay even if it took its sweet time getting here. The changing in the weather also means a return to the fields to begin the preparations for planting this years crops. After the monotony of winter sitting indoors to avoid the cold with nothing to do, the long list of things to complete starts to seem a bit daunting until you walk outside and feel the sun on your skin again. It all seems worth it after all. The end is near for the school year as students in the 9th and 12th grades begin to take pretests to practice for their final exit exams. Even though only the 9th and 12th grades are taking them the pretests have wrecked havoc on the day-to-day school function. Two teachers are present during for each grade and the tests last for half of the day which means at least four teachers on any given day will not be able to have class and of course the 9th and 12th forms will also be busy with tests. For me this hasn't caused to much of a change but in order to conduct the test each student is given their own desk to combat their ability to cheat from their neighbor. 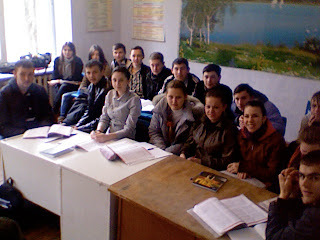 In Moldovan classrooms, however, the desks are designed to be shared by two students. So in order to have enough desks to fill the room for the students taking the pretest all but four of the tables from my classroom were taken to another room. Luckily we were able to find two other cast off tables that weren't being used and found a way to sit 20 students around 6 tables. Everything was going pretty well until about 10 minutes into my first class when a group of students came looking to scavenge another of our desks leaving us with only five. Sometimes you take for granted how used you are to a routine until something comes spices up your life a little. And as the school year winds down I think not having a routine is going to start becoming the norm for me which is going to make it a lot easy to count down those last few days. Taken with my laptop camera so its not the best quality. Is This a Weather Blog?